Israeli Prime Minister Benjamin Netanyahu promised on Sunday that the Golan Heights territory in northern Israel would "forever remain in Israeli hands," prompting an immediate endorsement from Republican presidential contender Ted Cruz, according to comments offered to the Free Beacon. During a speech at the site on Sunday, he said that Israel would never relinquish its right to the territory in the face of an encroaching threat from Islamic State terrorists and other forces as Syria continues to struggle with a sectarian war that has attracted jihadis. "I chose to have this festive Cabinet meeting on the Golan Heights to send a clear message: The Golan Heights will forever remain in Israeli hands," Netanyahu was quoted as telling reporters. "It's time, after 50 years, that the international community finally recognizes that the Golan will forever remain under Israeli sovereignty." Syrian leaders and the international community have repeatedly called on Israel to return the land to Syria. Embattled Syrian leader Bashar al Assad has stated that one of the preconditions for peace talks must include discussions about the Golan Heights’ return to Syrian control. "The Golan Heights have been an integral part of the Land of Israel since ancient times; the dozens of ancient synagogues in the area around us attest to this," Netanyahu said. "The Golan Heights are an integral part of the State of Israel in the new era. During the 19 years that the Golan Heights were under Syrian occupation, when they were a place for bunkers, wire fences, mines and aggression, they were for war." 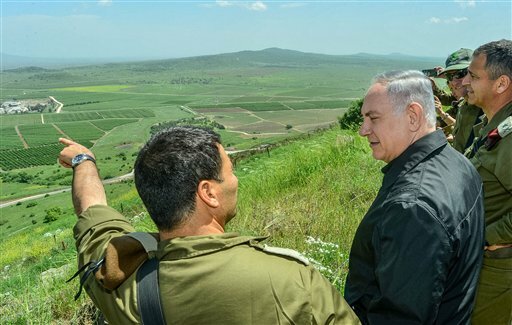 "In the 49 years that the Golan Heights have been under Israeli rule, they have been for agriculture, tourism, economic initiatives and building," Netanyahu said. "They are for peace. In the stormy region around us, Israel is the stabilizing factor; Israel is the solution, not the problem." Netanyahu said he had told Secretary of State John Kerry in a recent phone call that the Golan Heights is not on the table for discussion. Israel "will not oppose a diplomatic settlement in Syria, on condition that it not come at the expense of the security of the State of Israel," Netanyhau said, referring to threats from Iran, Lebanese Hezbollah, and ISIS. Cruz fully backed Netanyahu’s declaration on Sunday, telling the Free Beacon that the international community must stop pressuring Israel to return the territory. "Today, the government of Israel reiterated the reality that the Golan Heights are part of Israel's sovereign territory," Cruz said. "Given the presence of hostile terrorist organizations ranging from ISIS to Hezbollah on Israel's northern border, it is foolhardy and dangerous for elements in the international community to try to pressure Israel to abandon the Golan to the chaos engulfing Syria." The path to peace cannot involve Israel's abdication of its own security," Cruz said. "I applaud Prime Minister Netanyahu's courage in standing up for the safety of his people. America stands with you." The United States maintains that the Golan Heights do not belong to Israel, according to a State Department official. "The United States’ position on the status of the West Bank, East Jerusalem, Golan Heights and Gaza Strip is longstanding and unchanged. Those territories are not part of Israel. Every U.S. administration since 1967 – Democrat and Republican alike – has maintained this distinction," the State Department official said. This entry was posted in Politics and tagged Benjamin Netanyahu, Golan Heights, ISIS, Ted Cruz. Bookmark the permalink.